Ha ha. Mr. Perfect’s gaining more flaws by the day. Curse character development and rounding him out. At least Mordred’s having a good time at his expense. But none of that matters because I’m in love with Sarge (We are now talking about Red Vs Blue - if you don’t know what that is go see it.) all over again. RvB: Revelation. I missed the last season (RvB: Recreation) so I was just going to catch up with the dvds after this third arc was released – but my brother informed me that could not happen. In fact, he said “Screw the season you missed – go watch the first three episodes of Revelation. Now.” So I did. I appreciated episode 1 for the bit of recap for the series I missed – of course was happy to see Doc again. Episode 2 filled me with Glee when Sarge pulled a Batman and of course – Episode 3. Holy. Epic Moment of Awesome. *_* I watched it like three times just to make sure I was seeing what I was seeing and if Episode 3 wasn’t a true Crowning Moment of Awesome I dont’ know what is. I can’t even tell you what it was because it would ruin it and I can’t bear to do that to any RvB fans out there. I can see boats being a pain if there’s an issue, but are jets really safer? Heh heh, I like the way you drew Mordred having a good time at Wiglaf’s expense. His smile is very broad. I really like the colors in panels 2 and 3. I like that shade of blue used for the ocean background, and panel 3 looks neat with the mix of red and blue to represent the fire. Nice touch with the anchor on the boat. BTW, now that the strip’s in color, Mordred looks especially great in all his wicked merriment. :cool: He’s sure having fun now. That Red vs Blue episode was awesome wasn’t it? Monty really has made changes to the show! As a Grif fan I must say… Red Rules. Awesome comic as always! Honestly the boat isn’t too bad. Love the random stick people! Yay Lilly! And I totally agree about it being a CMoA for the Sarge and Grif. Especially when you considered that they won against the guy who took down a Hornet in less than a minute… On a side note, Wwhy couldn’t you just watch Recreation on the website? 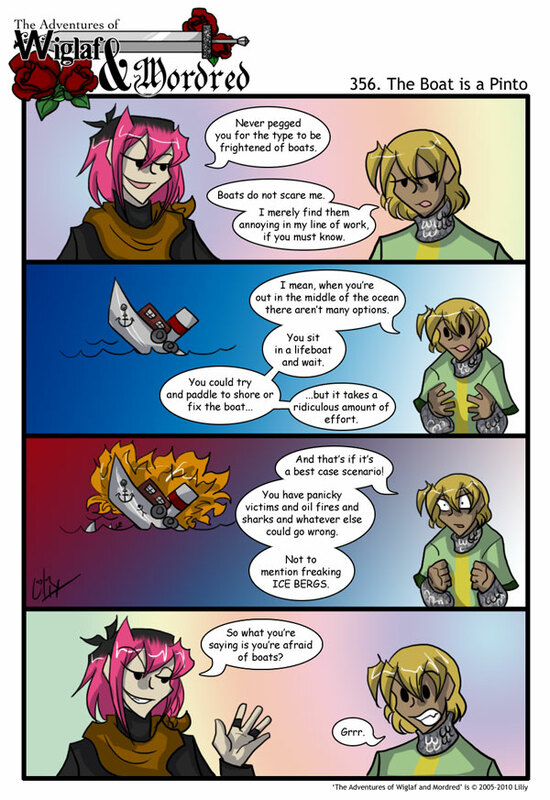 Disliking boats is not a flaw; he has some very logical reasons to dislike boats. In his mind, near everything becomes his responsibility (hero’s job description? ), and a malfunctioning boat is a heck of a lot of responsibility, some of which just gets worse with time. RvB is awesomesauce :D My favorite character has to be Caboose ^^ I haven’t seen all of the newer episodes though o.o need to get onto Rooster Teeth and go on a watching spree after Fall semester finally dies down XP Also, they have the old episodes up to Season 2 on Waypoint (accessed through X-box Live) My bro and I have a mental countdown on the Reach BETA :D It looks freakin sweeeeet! *cough* anyway, I love Wiglaf’s expression in panel 3 XD Of course, Wiglaf in his hatred of icebergs doesn’t take into consideration the fact that captains have most likely learned from the example of Titanic + his voyage will most likely NOT be through iceberg-infested water since he’ll be headed south of the equator.